Michelangelo di Ludovico di Lionardo di Buonarroti Simoni was born in 1475; at Caprese, in Casentino. His family Buonarroti Simoni, are mentioned in the Florentine chronicles as early as the XII century. In 1488, at the age of 13, he entered the workshop of Domenico Ghirlandaio. Thus he came under the influence of Masaccio, because his teacher, Ghirlandaio, not only looked to Masaccio for ideas on religious scenes, but actually imitated certain elements of his designs. After less than a year he moved to the academy set up by Lorenzo the Magnificent. From 1489 till 1492, he lived in the Palazzo Medici in Via Larga, where he could study �antique and good statues� and could meet the sophisticated humanists and writers of the Medici circle. Lorenzo the Magnificent died in 1492, and in 1494 the Medici were expelled from Florence. After the brief rule of the priest Savonarola, whose ascetic religion and republican ideas influenced the young man deeply, Michelangelo left Florence and went first to Venice and then to Bologna, where he could absorb their art and culture. In 1496, he eventually came to Rome and stayed there until 1501. In 1499, he completed Pieta for the Vatican. Christian emotion never has been more perfectly united with classical form. Returning, famous, to Florence in 1501, Michelangelo was commissioned by the new republican government to carve a colossal David, symbol of resistance and independence. In 1504, the Signoria of Florence commissioned Leonardo da Vinci and Michelangelo to paint the walls of the Grand Council Chamber in the Palazzo Vecchio, the seat of government of Florence. Leonardo worked on the Battle of Anghiari and Michelangelo on the the Battle of Cascina. Florence was immediately divided into two camps passionately supporting one or the other. Michelangelo's work did not come further than the cartoon for the picture, which also was destroyed in the civil conflict of 1512. In 1505, Michelangelo was summoned by the new Pope Julius II, to Rome and entrusted with the design of the pope�s tomb. The original grandiose project was never carried out. Although only 3 of the 40 life-size or larger figures were executed � Moses, Rebellious Slave (unfinished), Dying Slave � the commission dominated most of the artist's life. Victory and Crouching Boy were also carved for one of the projects of the tomb. The constantly aborted work on the tomb, ended only in 1547, 40 years and 5 revised contracts later. The final version of it is in San Pietro in Vincoli, Rome. In 1508, Julius transferred the artist to paint the Sistine Chapel ceiling. Michelangelo accepted the commission, but right from the start he considered Pope Julius� plans altogether too simple. It was something unheard of for a patron, to allow his own plans to be completely changed by an artist. In this case, moreover, the change of plan meant that the work would have an entirely different meaning from the original one. Since he was not very familiar with the technique of fresco, he needed the help of several Florentine painters, as well as their advice. But his ambition to produce a work that would be absolutely exceptional made it impossible for him to work with others, and in the end he did the whole thing himself. This was something quite unprecedented. Not only was the work so vast in scale, but no artist hitherto had ever undertaken a whole cycle of frescoes without an efficient group of helpers. 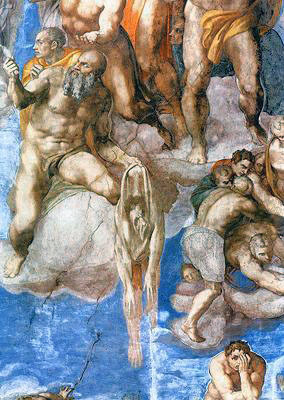 Michelangelo helped to create his own legend, complaining of the enormous difficulties of the enterprise. In his sonnet On the Painting of the Sistine Chapel, he describes all the discomforts involved in painting a ceiling, how he hates the place, and despairs of being a painter at all. After the death of Julius II in 1513, the two Medici popes, Leo X (1513-21) and Clement VII (1523-34) preferred to keep Michelangelo well away from Rome and from the tomb of Julius II, so that he could work on the Medici church of San Lorenzo in Florence. This work was aborted too, although Michelangelo was able to fulfill some of his architectural and sculptural projects in the Laurentian Library and the New Sacristy, or Medici Chapel, of San Lorenzo. The Medici Chapel fell not far short of being completed: two of the Medici tombs intended for the Chapel were installed Tomb of Giuliano de' Medici and Tomb of Lorenzo de' Medici, and for the 3rd Michelangelo had carved his last great Madonna (unfinished) when he left Florence forever in 1534. It was during this period, while he was planning the tombs in the New Sacristy, that the sacking of Rome occurred (1527), and when Florence was besieged shortly after, he helped in fortifying the city, which finally came back into Medici hands in 1530. While the siege was still on, he managed to get away for a while to look after his own property. He incurred the displeasure of Alessandro de Medici, who was murdered by Lorenzino in 1537. This event he commemorated in his bust of Brutus. In September 1534, Michelangelo settled down finally in Rome, and he was to stay there for the rest of his life, despite flattering invitations from Cosimo I Medici at Florence. The new Pope, a Farnese who took the name of Paul III, confirmed the commission that Clement VII had already given him for a large fresco of The Last Judgment over the altar of the Sistine Chapel. Far from being an extension of the ceiling, this was entirely a novel statement. Between 2 projects about 20 years had passed, full of political events and personal sorrows. The mood of The Last Judgment is somber; the vengeful naked Christ is not a figure of consolation, and even the Saved struggle painfully towards Salvation. The work was officially unveiled on 31 October 1541. Michelangelo's last paintings were frescos of the Cappella Paolina just beside the Sistine Chapel, completed in 1550, when he was 75 years old, The Conversion of Paul and The Crucifixion of St. Peter. Michelangelo's crowning achievement, however, was architectural. In 1537-39, he received commission to reshape Campidoglio, the top of Rome's Capitoline Hill, into a squire. Although not completed until long after his death, the project was carried out essentially as he had designed it. In 1546, Michelangelo was appointed architect to St. Peter's. The cathedral was constructed according to Donato Bramante�s plan, but Michelangelo became ultimately responsible for its dome and the altar end of the building on the exterior. He continued in his last years to write poetry, he carved the two extraordinary, haunting and pathetic late Pietas, one of them The Rondanini Pieta in Milan, on which he was working 6 days before his death. He died on 18th of February 1564 at the age of 89 and was buried in Florence according to his wishes.